The Hon Kerry Sanderson AC commenced as ECU’s fourth Chancellor on 1 January 2019. From 2014 to 2018, Mrs Sanderson was Governor of Western Australia, the first woman to serve in this role. Prior to being appointed Governor Mrs Sanderson served in a wide range of board positions, including as Chairman of Gold Corporation, Independent Chair of the State Emergency Management Committee, Non-Executive Director of listed companies Downer EDI and Atlas Iron and Director of the International Centre for Radio Astronomy Research. She has participated in a number of charitable and community activities including as a Board Member of Senses Australia and of the Paraplegic Benefit Fund. She is currently Chair of the St John of God Health Care Board (since May 2018) and Chair of the not-for-profit WA Parks Foundation (since October 2016) as well as being patron of a number of charitable and community organisations. She has held a range of senior positions in the public service and in business, including the London based Agent General for Western Australia (2008 to 2011), Chief Executive Officer of Fremantle Ports for 17 years (1991 to 2008), Deputy Director General of Transport for Western Australia and Director of the Economic and Financial Policy Division of the Western Australian State Treasury. She was awarded the Centenary Medal in 2001 for her service to the maritime industry, was appointed as an Officer of the Order of Australia in 2004 for her service to the port and maritime industries and to public sector governance, and was appointed as a Companion of the Order of Australia in 2016 for her eminent service to the people of Western Australia. She was Telstra Business Woman of the Year (Western Australia) in 1996 and has been awarded Honorary Doctorates by both the University of Western Australia (Doctor of Letters honoris causa) and Murdoch University (Doctor of the University honoris causa). Edith Cowan University courses are developed in consultation with industry, and teaching staff have extensive industry experience and networks. It’s why ECU students can expect placement opportunities, fieldwork, practicums and networking events as part of their studies. Universities Guide 2016 for the seventh year in a row. Her example informs Edith Cowan University’s values as we pride ourselves in developing capable graduates who lead engaged and productive lives in the communities in which they live and work. ECU has more than 27,000 undergraduate and postgraduate students. We also annually welcome over 4,000 international students, originating from more than 100 countries. 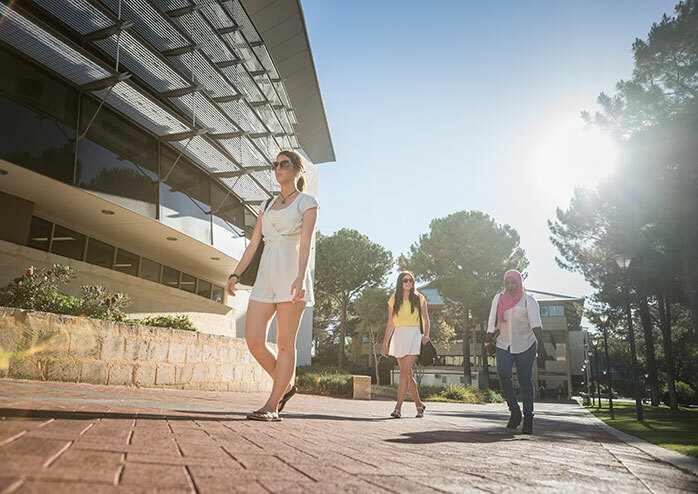 ECU’s eight Schools collectively deliver more than 300 diverse courses across Health & Medical Sciences, Engineering, Education, Arts & Humanities, Business & Law, Nursing & Midwifery, Science and the Western Australian Academy of Performing Arts. Edith Cowan University incorporates the world-renowned Western Australian Academy of Performing Arts, the oldest and most popular School of Education in Western Australia, the largest Nursing program in the State, and Kurongkurl Katitjin, our Centre for Australian Indigenous Education and Research. (2016 QS World University rankings). ECU was also named in the 2016 Times Higher Education (THE) 150 Under 50. ECU received five-stars for our teaching quality in the Good Universities Guide 2016 for the seventh year in a row. One of 32 institutions accepted for the Science in Australia Gender Equity (SAGE) Pilot of the Athena SWAN Charter. ECU's research is dedicated to making positive impacts on communities in areas such as health, wellness and education. The University Council is the governing body which controls and manages the operation, affairs, concerns and property of the University, in accordance with the Corporate Governance Statement. The University Council and the senior management team work together to ensure that the University achieves its goals.